* I received complimentary media passes to Raging Waters San Jose so I can post an honest review. Thoughts are my own. Are you ready to say goodbye to summer?? We’re just about to get into the fall season and a visit to a water park is the best way to end our summer! Temperatures were really high last Saturday so my family and I decided to go to Raging Waters San Jose. 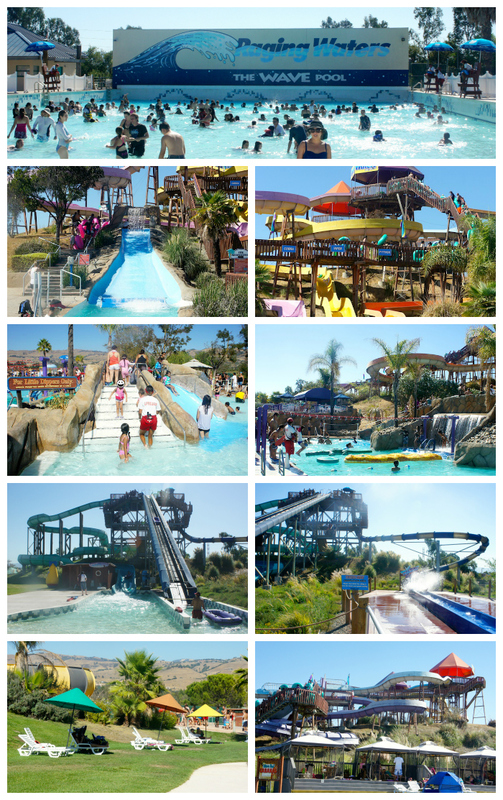 Did you know that Raging Waters San Jose is Northern California’s largest water park? They have lots of water attractions including the Wave Pool and the newest thrill ride Bombs Away. They have various pools, rides and slides that cater to kids and adults so everyone in the family will enjoy their time in the water park. When we got there, my son wasn’t in such a good mood and he got intimidated by the water. We first tried to get him to play at the Wacky Water Works. You can see it in the photo below. My husband and I enjoyed it but our little one was too scared of all the water being squirted around. We went to the Pirate’s Cove because it was bigger so we can sit on the shallow part of the pool and let him watch all the kids playing and enjoying. And after just a few minutes of him watching other kids, he decided to let go of me and start playing. We liked sitting at the left side of the Pirate’s Cove because it’s right beside the Wave Pool and you can feel a mellowed down version of the wave they’re getting on the other side. It was fun to see my son saying “sowee” (sorry) to the other kids that were getting swept by the wave. They had so many different rides and slides but I chose to stay with my son and let him play in the water at the kiddie pools. 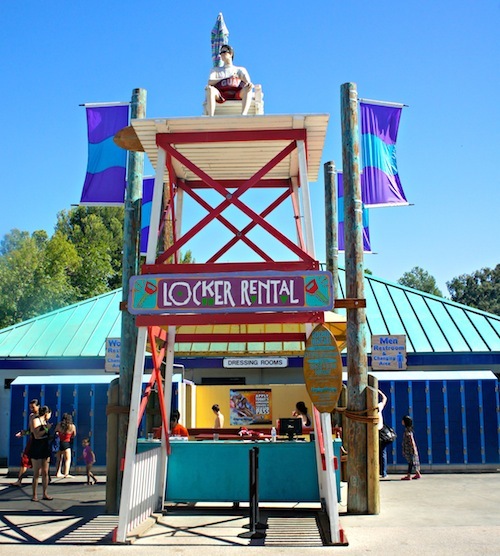 I love that Raging Waters has lots of options for kids — and lots of lifeguards too! Here are a few more photos. And if you want your stuff to be safe, they have lockers that are available for rent. We chose to rent one so we can keep our phones and wallets safe. But our other stuff — towels and clothes — were kept in our bag which we just left on one of the beach chairs beside the Endless River. I think the only drawback for our visit was the long wait at the ticket booths. And an employee didn’t know what to do when I said I had tickets on Will Call; she told me to proceed to another booth only to be told to go back to the first booth. It might be because they were very busy last Saturday and they might not have expected it. Still I think establishments should quickly adapt so that their service levels won’t suffer. Apart from that, we had a really great time. Just a little bump on the road with the ticket booths but everything else was perfect. 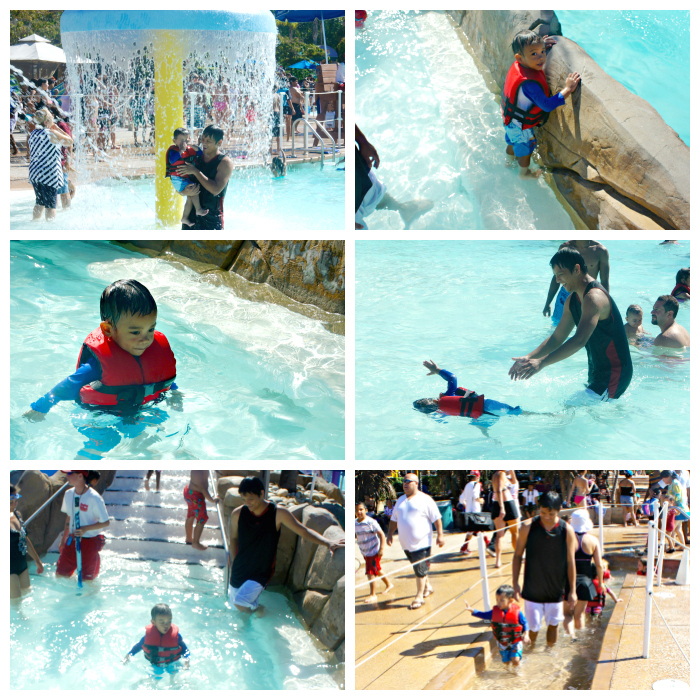 Here are some photos of my son enjoying his time in the water. 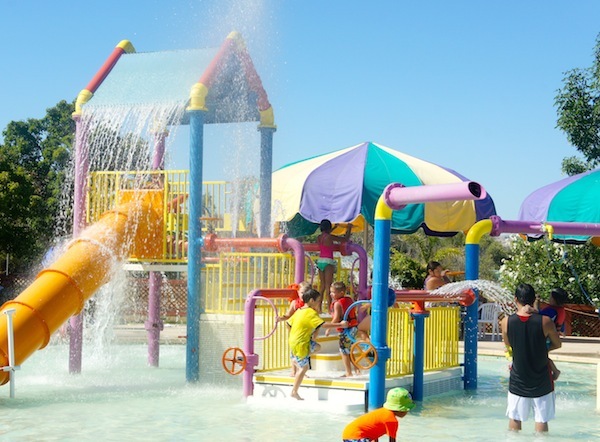 So go ahead and plan a trip to Raging Waters San Jose tomorrow or Sunday for some last-minute summer fun! This weekend, September 14 & 15, is the last weekend that Raging Waters will be open for this season. 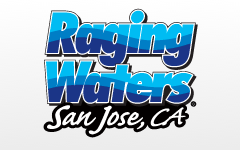 Raging Waters San Jose is located at 2333 South White Road, San Jose, CA 95148. It’s just off Tully Road and Capitol Expressway on the Lake Cunningham Regional Park, and is easily accessible from major highways. You can call them at (408) 238-9900 or visit their website at RWSplash.com for more information. * I received complimentary media passes to Raging Waters San Jose to facilitate this review feature. Thoughts are my own. I have a new appreciation for the extensive water park, having just returned from Disney. This one looks awesome, I hope we get there some day! Mitch recently posted..Party at Serendipity 3 with #HelloKitty, #SparkleBee, and #PaulFrank: Thanks @SparkleBee! 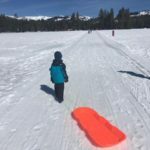 Oh my gosh – I remember Raging Waters when I was a kid! We haven’t taken our kids there yet, but would love to someday. Looks like you had a blast! What a great way to end the summer! My kids would love it! Looks like so much fun!!! WOW. I think this time of the year is the best to go. Not much lines and TONS of fun. I have to make this a place to visit when I am in the area. Oh my gosh – that looks like SO much fun! Now I want to travel there just to spent time at this water park! Looks like fun. 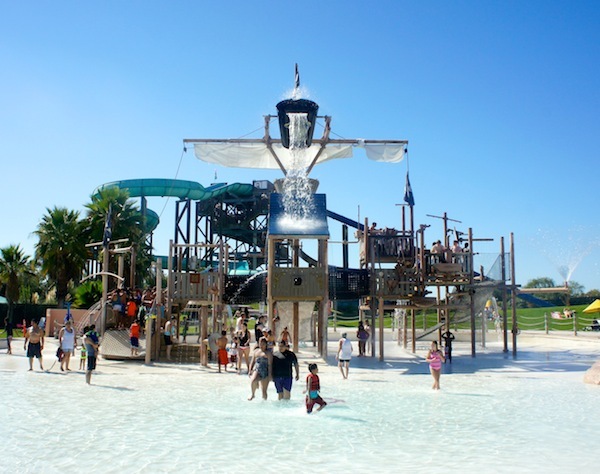 Water parks are a place where the whole family can enjoy themselves. This really looks like a fun time, I hope to be able to take my children some time. Oh my this place looks like a blast! We will have to check this out next time we are in town. Thanks for sharing I have no idea about this place. Wow this looks amazing. I am so jealous right now since it’s snowing here. Looks like an awesome place! I love water parks. I’m sitting here in freezing CT weather wishing I was in San Jose. This water park looks so inviting. What fun for a family or friends. Hope i get there some time. How much fun! I haven’t been to a water park in ages. Even at my age I would go. I love going to water parks with the kids, but this one looks like it takes the cake.I think from the sound of it you had a really enjoyable time there.The pictures you took are beautiful. That is my kind of place. I love water parks and water slides, We used to go and spend the day. There’s no better way to spend a hot summer day. I love water parks and I have heard great things about Raging Waters!!! I live not too far from San Jose, so hopefully in the near future our family will be able to take a trip together. You guys look like you had a blast! That looks like so much fun. I don’t think anyone could stay in a bad mood for too long there. I wish we lived nearby. I’d go.